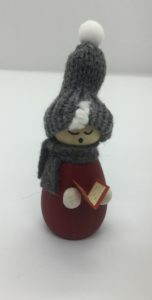 Home / STORE / Nisse / Nisse Caroler Boy. The boy Caroler is warmly wrapped up to keep out the cold winter weather, while bringing merriment at Christmastime. 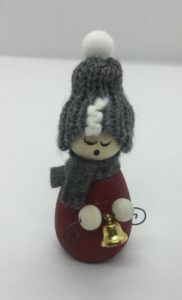 He has white woolen hair pocking out from under his hat and he is carrying either a Bell or a paperback carol songbook. He has a wooden body with wood bead hands. A grey woolen scarf and hat with a white bobble on top.